I love Phlox paniculata ‘ David’ and have bought it numerous times only to see it wither away. This week the stars are aligned and ‘David’ is in bloom. 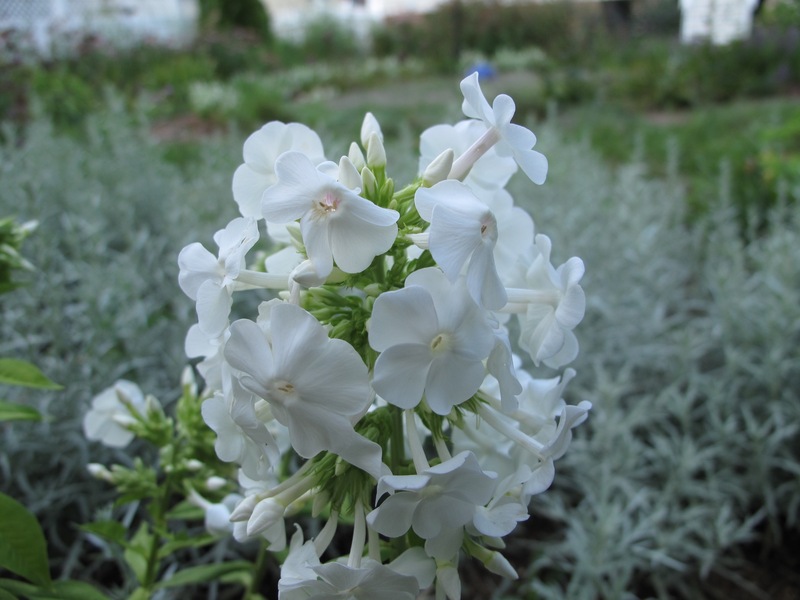 This entry was posted in garden and tagged annuals, Phlox paniculata ‘ David’ (Garden Phlox), wordless wednesday on July 13, 2016 by pbmgarden. Mosquitoes were biting so much when I photographed this phlox I didn’t notice the fragrance. Went back outside and checked, and yes, it is fragrant. Nice surprise. David is a stunner as are your photos Susie with that gray-green foliage in the background! Thanks Donna. The grayish foliage is a pass-along perennial Dusty Miller. David rarely goes into the garden so he doesn’t know yet, but will get an email of this blog post and find his surprise. I clipped one bloom to show him. The fragrance is described as spicy vanilla-clove but I don’t identify more than just that it does have a nice scent. Pure white always looks great in the summer! Glad it’s hanging in there this year. Have you ever tried it in part shade? Might help with the heat. I agree, there’s something about white flowers I’m quite partial to. This one is probably getting less afternoon shade than in other places I’ve tried it. That may be helping it. Also, it’s getting lots of rain. Lovely, Susie. I have a stand of David that is doing quite well. It’s now starting to fade, so I will dead head and expect to get another set of blooms. John I remember seeing yours in a vase a few weeks ago so I was primed to want to buy this one at Southern States when I saw it! Thanks for the deadheading tip. It’s a beauty. Good luck this time. Thanks Annette. 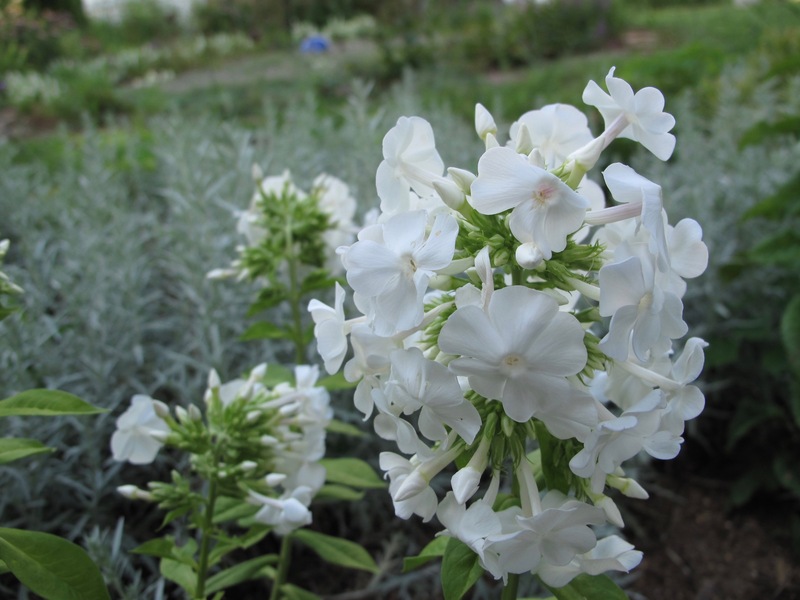 Phlox don’t like out hot, humid summers much either but this hybrid is reputed to be humidity-tolerant and less prone to powdery mildew than other phlox. I hope there will be more phlox to share Cathy. Fingers crossed this one will continue to grow. Beautiful! Sadly, phlox is yet another plant genus else that doesn’t much like SoCal. Phlox seem to be very thirsty plants. I gave them for a few years because the deer were devouring them. Our little fence deters them now, although I realize they could jump it if they wanted. Several people asked about scent so I ran back outside and cut a stem to enjoy indoors. It has a slight, but not strong fragrance. Of course it was 97 degrees today and who can smell their best under these conditions? Oh, yes! One of the truly great varieties of P. paniculata. And a very vigorous plant. ‘David’ is a phlox I really like but it’s not been reliable before. This year it’s holding up and it must be the extra rain. We have P. White Admiral, which looks very simular.